Where’s Google Photos in this drop-down menu? 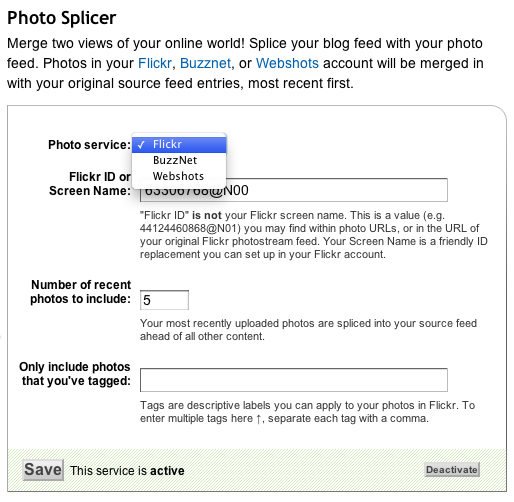 If you use FeedBurner (which has been part of Google for a good number of years now), you probably know about the Photo Splicer feature, which allows you to merge your photo feed from services like Flickr, BuzzNet or Webshots into your site feed, providing extra content for your readers. It’s a great little option and I hope Google keeps it turned on for years to come. My question for Googlers reading this is simple: where’s Google Photos (PicasaWeb) in that drop-down menu? Isn’t it about time for it to show up there? Previous Post Want to see what I did this summer?